Willsboro Town Hall is located at 5 Farrell Road, Willsboro, NY 12996; phone: 518-963-8668. Photo: Adsit Log Cabin, Willsboro, Essex County, NY. 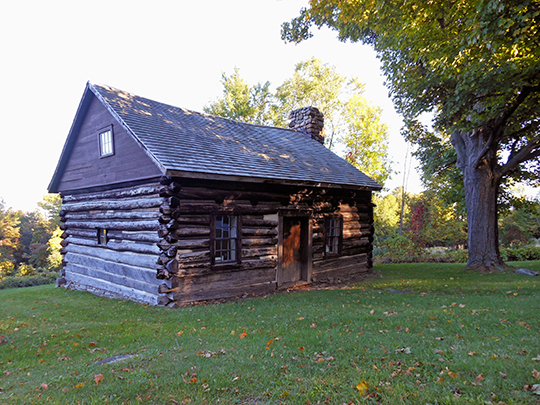 Built by Samuel Adsit in 1778, the cabin is believed to be one of the oldest in the U.S. that exists at its original location. Listed on the National Register of Historic Places in 1992. Photographed by User:Bryan Nelson Elder (own work), 2012, [cc-by-3.0 (creativecommons.org/licenses/by/3.0)], via Wikimedia Commons, accessed February, 2014. The incorporated Town of Willsboro, then spelled Willsborough, was formed on March 7, 1788. It covered the territory that would become the present day Towns of Lewis, Chesterfield, Jay, Essex, Wilmington, St. Armand, North Elba, Keene and part of Peru. Over time, portions were divided and reincorporated as separate Towns until 1805, when the Town reached its present size. The 19th century saw a Willsboro that grew and thrived. By 1818 Willsboro had sawmills, a gristmill, blacksmith shops, taverns, a tannery and stores. The population in 1850 of 1,932 was comparable to 2010 (2,025). Farming was an integral part of Willsboro since the latter part of the 1700s. In the 1860s half of Essex County was farmland. Willsboro Point alone had approximately fifteen farms. Willsboro's farmers produced for local consumption and served distant markets such as New York City. Agriculture was not only a way of life and a means of feeding families, the Town and the state played a role in tourism. Buyers who came to purchase products also brought their families back to vacation on the shores of Lake Champlain. Growth accelerated in the late 1880s. The railroad came through Town, school districts were centralized, agriculture and industry were doing well, and tourism was firmly established. Willsboro's natural, rural beauty and waterways drew visitors before and since its establishment as a Town. Boaters on Lake Champlain would stop or return to camp on the shores. There was a hotel at the end of the point before 1883. Tourism continued to grow into the 1900s. There were already summer camps at the head of Willsboro Bay. Tourism was supported by Willsboro's residents who built and maintained camps to rent for additional income. Further evidence of the Town's popularity as a destination was the Clubhouse in Buena Vista. In 1927 the Clubhouse featured a grand ballroom that accommodated 75 guests. A bus service was provided from Albany to Buena Vista from Friday night to Sunday night so that people might easily travel to hear the nationally renowned bands that played every summer weekend. Industry was part of the Town's early commerce beginning with the mills powered by the Boquet River. The Champlain Fiber Company was built in 1881. The blue limestone quarry at Ligonier Point was at a peak in 1860. The special limestone was used in the construction of the New York State Capital and in the suspension of anchors from the Brooklyn Bridge. The first wollastonite processing plant was built in the 1950s. Willsboro's (and Lewis's) mineral resources of wollastonite are reputed to be the largest reserve in the world. Like any town, Willsboro endured difficulties of growth and disaster. Flooding from the Boquet River and fires interrupted life and commerce from time to time. In 1913 the Great Flood destroyed businesses along the river. Today, Willsboro's rich soils and gentle slopes still attract agriculture and forestry. Farmers strive to maintain their family traditions, produce food, and create a sense of countryside. Artifacts drawn from the earth, historic markers, and old homesteads such as the Adsit Cabin stand as reminders of Willsboro's place in American history. The Town's geography continues to determine its difficulties, choices of way of life, characteristics and appeal. Willsboro, the oldest Town in Essex County, maintains rural qualities of natural beauty and a neighborly ambience. It does not stand still. Willsboro has been recognized as the location for pioneering work in projects such as the fish ladder on the Boquet, environmental conservation projects done by the Boquet River Association, and Cornell University College of Agriculture's Research Farm. And, not least of its roles, the Town once seen as a humble mill town is still a beloved summer destination of great beauty. Town of Willsboro New York, Comprehensive Land Use and Action Plan, 2012, www.townofwillsboro.com, accessed February, 2014.